Dictionaries sort words by alphabetical order, which is convenient if you are looking for a definition, but masochistic if you are trying to figure out which words are the important ones. One way is to sort them by frequency of usage. You take a bunch of French text and you count how many times each words appears, then you sort them by their frequency. 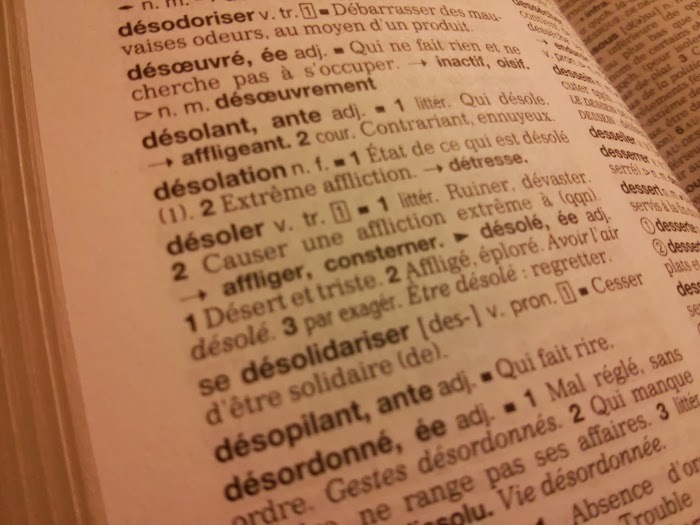 Common words like de, je and le appear at the very top, and words like macarron, compétiteur and an antisportif show up at the bottom. You have to do some trickery to combine words that share the same stem (for example: enchanté, enchantée, enchantés and enchantées) so they all add up as the same word, but it’s manageable. Here is my quick-and-dirty attempt to sort French words based on their usage (the file has four columns: stem, frequency, the most common word with that stem, that word without any accents (I use this column to play a guessing game)). Once you have that file, you can start enjoying some seriously fun language-geekery. The White Whale of French accents has to be the é. Every French student knows that the participe passé of -er verbs like chanter ends in é (chanté), but what are the rules governing words like préféré, élève, or fréquence? Some sites can tell you the multiple spelling rules with their corresponding multiple exceptions, but they are not very helpful because our brains are not wired to deal with detailed rules and exceptions. Besides, native French speakers don’t study these rules. What we excel at is association and intuition. It’s much easier to memorize the lyrics of a song than 100 random words. I have always wanted to know if I should accent words that begin with e. In the past, I grabbed my Petit Robert and tried making a list of words that began with é and another of words that began with e. I then promptly went on to forget everything from both lists. A better approach is to focus on a few common words each day and reverse engineer the spelling rules. To add another layer of association, you can group them by type of word: words that begin with é, words that contain two és separated by a consonant, words that have an é in the second position. Pick whatever you are having trouble with. In total, there are 123 words, but they are not all equally important: école is 25 times more common than épicerie. There are around 200 commonly-used words that start with e. If we compare both lists we can see that no word that starts with é is followed by an x, an s, or a double consonant (ll, rr, ff). The words that break the n/m rule contain an é that is pronounced by itself (it forms its own syllable), unlike the rest of en/em words. You should focus your memorization efforts on these outcasts and assume that the remaining words follow the rule. Holy Molly! This breakdown shows that words that begin with dé or ré make up 60% of the common words that have é in the second position ((113 + 64) / 300). Let’s focus on those two. Well, that’s interesting. There are twice as many dé words than de words, but there are twice as many re words as there are ré words. This means that if you are not sure how to accent a word you should guess dé and re. Unfortunately there doesn’t seem to be any obvious rules that we can follow to determine if these words should have é or e, so we will have to come up with our own associations. There are hundreds of little tricks but this post has gone on long enough. I hope this approach makes your studying more effective. Let me know how it goes and share your own strategies in the comments. UPDATE: Regarding a few comments on Reddit The diacritics are there to change the pronunciation, but non-native speakers don’t always know if a word should be pronounced é or e. I don’t know if it’s because I’m Spanish, but I’m tempted to want to say sécret (just like sécurité) instead of secret. If I know how secret is written, I can make an effort to pronounce it properly; other times I will use my knowledge of how it’s pronounced to write it properly. It’s a two-prong approach.